While preparing the Convent La Concepción for its reopening as the Museo de Semana Santa (Holy Week Museum) they have uncovered new colors, secrets and surprises. 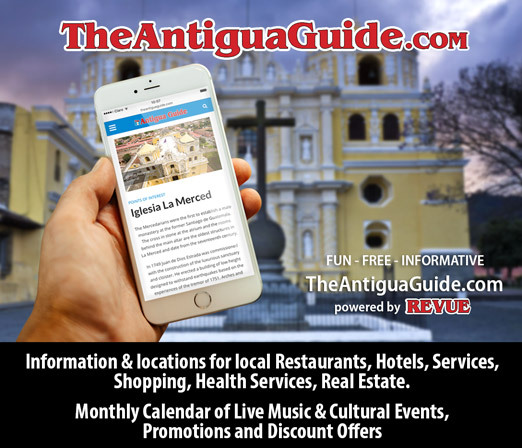 In June 1737 the nuns of Convent La Concepción invited the town of Santiago de los Caballeros, now La Antigua Guatemala, to a celebration. Sound strange? Yes, but the lovely young ladies of convents in the colonial city were no ordinary nuns and led somewhat different lives than what we might expect today. La Concepción was the first convent founded in Santiago (1578), as well as the largest, richest and most sumptuous. The La Concepción nuns were especially privileged, being daughters of Spanish nobility and bringing with them hefty dowries. Life in the convent, rather than being marked by devotion, seclusion and vows of poverty, allowed these women to avoid unwanted marriages and relaxed the rules so they could pursue the arts and even carry on businesses. Festivities within the convents, with guests of family, friends and the court, were common. In fact, they became so extravagant and raucous that they brought complaints from the neighbors. The story, as reported in the October 2007 Revue, continues to unfold. Since 2007 the National Council for the Protection of La Antigua Guatemala, called the Consejo, the University of San Carlos (USAC) and the Republic of China (Taiwan) have been working to prepare the convent for its reopening as the Museo de Semana Santa (Holy Week Museum). During the past year they have uncovered colors, secrets and surprises. Short stairways to the fountain have also been uncovered. A wooden platform is being constructed so visitors can appreciate the fountain at close view without touching it. 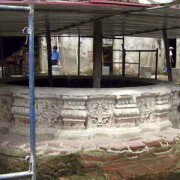 The dream is that the fountain, filled with water, will function again. Simple, square, concrete bases have been set for columns to support a roof over the corridor around the fountain patio. 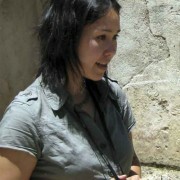 Rocío explains that they found remains of the bottoms of the bases, “…so we knew they were here. But we didn’t know what they looked like, so we made them very simple.” Off the corridor are rooms that served various functions, including a chapel earlier thought to be the private chapel of Sister Juana de Maldonado y Paz, the most famous recluse of La Concepción Convent for her writing, theater and music. “But Sister Juana never saw this,” Reyes announces quietly. What?! Say that again! 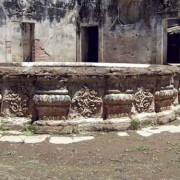 Careful research of recent months in the Archives of Central America in Guatemala City and study of construction materials and style of adornment show that the whole patio area, including fountain, are from the 18th century, not the 17th, when Sister Juana lived there. 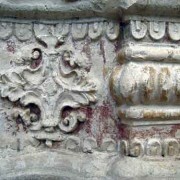 Indications are that the cloister seen today was built between the earthquakes of 1717 and 1773. “There is probably a fountain under this one that was here at that time,” Reyes continues. The excavation team believes there are as many as six layers of construction in the convent, each built on top of rubble of destruction of the previous. 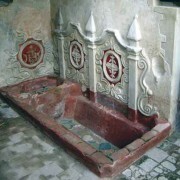 A quick word of reassurance to lovers of the legend of the illustrious Sister Juana: the tiled hot water bathtub further back in the private cloister-within-a-cloister is indeed verified to be hers, its red richness now recovered through painstaking treatments of nopal. The system for heating the water and channeling it to run into the tub is clearly evident. Sister Juana became Mother Superior and after her death was buried under the altar of the convent church. Her luxurious private quarters, provided by her wealthy and doting dad, were left to a trusted nun, who eventually sold them to another family of another young nun. According to the archives the quarters were two-storied, but nothing remains of the second floor. 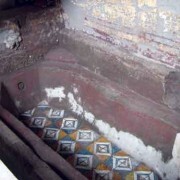 Just weeks before writing of this article, a similar, hand-painted tile bathtub was discovered several meters from that of Sister Juana. 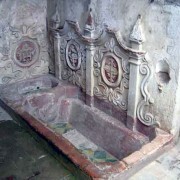 In the same area are a washstand with two hand sinks, including original stone stoppers, another fountain, another pila and what seems to be an herb garden box. Studies and digs continue for more information. Records show that the convent was so populous by 1633 that the nuns urgently petitioned for and were granted more space, pushing the walls out, absorbing and rerouting the street of that time. The Convent of La Concepción closed, like most of Santiago, after the earthquake of 1773, when the seat of the Spanish government moved to what is now Guatemala City. But its own end actually came before that, its numbers diminishing like other religious institutions, suffering from effects of declining religious dedication. It had become but a “testimonial to past glory,” wrote Magda de Aragón in the Guión Museológico para el Museo de la Semana Santa. 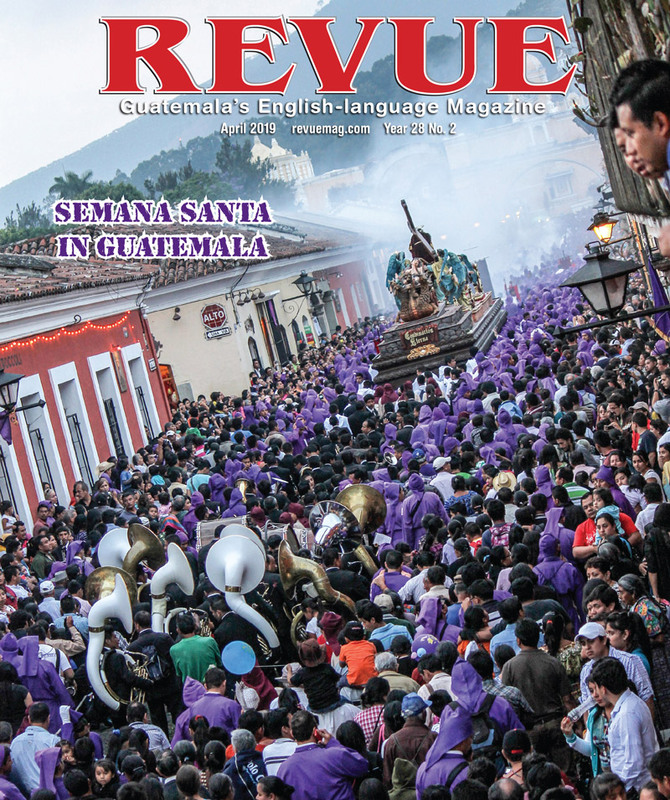 For more La Concepción history, see the October 2007 Revue at www.revuemag.com. The author thanks Elizabeth Bell for her assistance.